We'll get it there! We use USPS Mail. They have been consistent and cost effective. First class mail usually takes 3-5 days and Priority takes 2-3 days. This Christmas if we feel that an upgrade is needed for timely delivery we'll eat the extra cost to make sure you get it for your Holiday! There are also options to use UPS. We ship from Greenville, Michigan USA! We ship FREE usps first class on orders 30 US dollars or some items being promoted as "Free Shipping" This can take 3-7 days in most cases but is not guaranteed (US Only). On orders over 40 US dollars there is an upgrade to FREE priority shipping. This usually takes 2-3 days although 98% of the time is spot on but again is not guaranteed. All orders ship from Greenville, Michigan. During Promotional periods we ship via a private carrier that delivers your packages to the post office. But this economical value is only available during high volume times when we have many international order going out. It can take up to 3 weeks as we collect and submit orders for shipping in bulk. The promotional shipping rate will be available early in the holiday season as well as during promotional periods. It can take up to 2 weeks or longer to get goods internationally first class mail. Priority mail takes 6-10 Days and Express is 2-3 days. You are responsible for all incoming taxes and charges that are due in your respective countries. We offer a FREE Scotland Rising Cinch bag on all order over 24.99. There is a limit of 1 per customer. 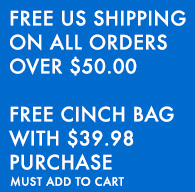 All you have to do is have 24.99 in your cart go to the "free cinch bag" and add the bag to your cart. The discount should be taken automatically. If you have any problems please contact us. @ 877.498.SCOT leave a message we will contact you back. Using the Contact us form is the best way to contact us. We do not always answer our toll free number but we always call back if it is needed. If you call us @ 877.498.7268 leave a detailed message with a return call time and we will try to accommodate you the best we can. RETURN FOR REFUND: You can return any item (except custom products) for refund less a 20% Restocking fee within 30 days provided it is still in the same condition as when it left. You are responsible for the return shipping and you will be credited upon receipt. WRONG ITEM RECEIVED: We never mack mistakes...But if you think we made one do call us at 877.498.SCOT we will gladly make arrangements with you to get you the correct item(s).